Hocus Pocus is a movie I’ve loved since I was a kid! It has that wonderful balance of fun and scary that is in perfect balance for the Halloween holiday. All I had to see was the cover and the word ‘sequel’ in the title and I was sold! Unfortunately, the book didn’t quite hold a Black Flame candle to the original. The first 1/3 of the novel is indeed the original story of Hocus Pocus yet in book form. It’s extremely accurate to the movie and I did have a lot of fun reading it. There are a few tiny details added in to give a little more insight into the characters but I wish the author pushed it even further. But alas, the focus was setting up the sequel portion that takes place 25 years later with Max and Allison’s daughter Poppy as the star. 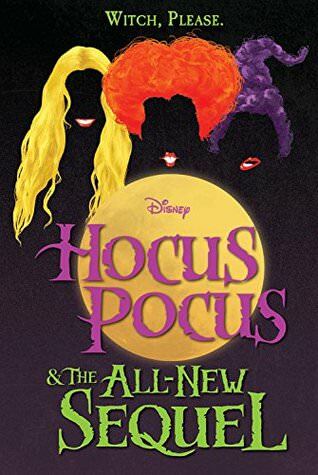 The sequel is very reminiscent of the original story as it is indeed Halloween night and in an effort to to impress her crush Isabella, Poppy calls on the spirits and unwillingly brings back the Sanderson sisters from Hell, replacing them with the original three characters – Max, Allison, and her aunt Dani in their wake. Now Poppy, along with her friend Travis and her crush Isabella, are on a mission against time to save her family and stop the witches who so desperately want to stake their claim on the world. It was so very fun to have the Sanderson witches back! We even see a reappearance of the beloved Binx and his sister, Emily. Having all of those beloved characters together again brought a huge smile to my face. But, I just couldn’t get into the characters and the plot in the same way. It all seemed a little too ridiculous to me – a Boston Terrier transformation, characters being transported to Hell, ‘zombie-like’ teens doing the witches bidding. And okay, I get that some of the original had that fun quirkiness about it too but the sequel felt like it was trying a little too hard and didn’t hold that same level of fun and magic. Of course there were a few great moments too and I think readers will enjoy seeing the witches take to even newer technology than seen in the early 90s. On a whole, the sequel didn’t quite live up to my expectations of a story I’ve loved for so many years. It was fun to see all of those familiar faces again and to learn what has become of them over the years so that was worth picking it up for. And perhaps the nostalgia from some readers will make this a better reading experience for them than it did for me. oh I loved Hocus Pocus, so I’m sorry to hear that this didn’t work for you. I thought a sequel might’ve been fun of this one. I’ve actually never seen Hocus Pocus. (I know, what am I doing with my life, right? LOL) Sorry to hear this one didn’t really measure up to the original for you. I really didn’t care for the Hocus Pocus movie, which is kind of sacrilegious considering how big into Halloween I am. Sad that the book wasn’t all that. I’ve only seen the movie, and I did like it! Sorry this didn’t live up to the first book. That’s a bummer the sequel didn’t really live up to the original story/movie. I do love Hocus Pocus, but I think I’ll just skip reading this one!